The best bridal and dress alterations studio in Sydney specialising in wedding dress alterations, bridesmaid dress alterations and evening dress alterations. 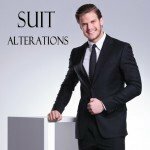 We also provide a range of clothing alterations services including invisible mending, suit alterations, shirt alterations, pants alterations, jeans alterations, coat alterations, and clothing repair etc. If you have any questions about how your dress could be altered to fit you, please text us and attach photos of your dress on +61 499 980 268 or email them to ask@lacouturier.com.au. Copyright © 2019 La Couturier Alterations. All Rights Reserved.